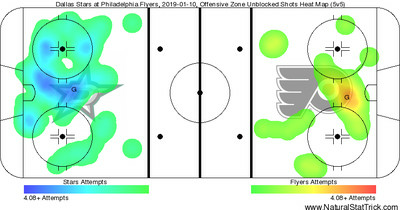 The Flyers opened the game with a good amount of energy and tenacity for the puck, and it resulted in a strong scoring chance less than two minutes in. James van Riemsdyk lugged the puck up the ice and made a pass at the blueline to Shayne Gostisbehere, who found the net driving Giroux who would be stopped by Anton Khudobin. JVR returned to the top line in an attempt to get his game going with Giroux and Travis Konecny. Other than that chance, much of the first period was a sloppy affair for both teams. Pucks hopping over sticks, failed zone entries, and failures to keep the puck in the zone. There weren’t a whole lot of whistles early on, but it’s hard to say the pace of the game was good or enjoyable at all for that matter. Overall however, the Flyers did well at breaking up pass attempts and denying zone entries. As the halfway mark of the period hit, Dallas began to control play a bit more and keep the Flyers hemmed in their own zone. The quality of chances Dallas was generating wasn’t the best, and the defense kept them to the outside for the most part, but the early momentum the Flyers had clearly dissipated. Sean Couturier found Ivan Provorov for a great chance as they attempted to get that momentum back, but the pass was in Provy’s skate and he was unable to get a shot off. Nolan Patrick made a great move on Esa Lindell as the period was coming to a close, but his shot was denied by Khudobin. The period would end scoreless and the metrics for the period resembled that. Dallas lead narrowly in Corsi 18-16, scoring chances 7-6, and the two teams were tied in high danger chances at two. The second line of Jakub Voracek, Couturier, and Oskar Lindblom lead the way for the Flyers with perfect Corsi’s, and at the bottom was the fourth line of Phil Varone, Dale Weise, and Michael Raffl. 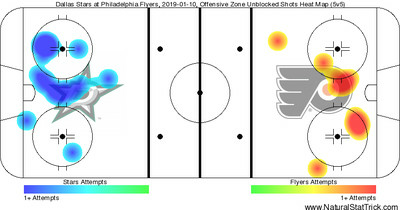 The Flyers would finally be the team to strike first after a scoreless opening period, as James van Riemsdyk started the play with a good read in the defensive zone. Radko Gudas fired a shot on goal that JVR followed up and made an oh so glorious pass to Travis Konecny who made no mistake, beating Khudobin and giving the Flyers a 1-0 lead. JVR’s return hasn’t been all that great, and some of it not his own doing, but that was an absolutely perfect pass to TK. Dallas began to test Carter Hart who looked strong in the first period, and Hart was up to the task. He made a great post-to-post save on a wraparound attempt, and settled down any rebounds keeping the Flyers defense rested and fresh. He wasn’t tested much in the early going of this one, facing just 10 shots around the five minute mark of the second period, and that was due large in part to the effort from the Flyers defensively keeping Dallas to the outside. Play would finally open up a bit as Sean Couturier and Mattias Janmark went off for tripping and high sticking respectively. No one would score on the 4-on-4, but the Flyers would then head to an extended power play with a delayed penalty on Dallas, and in that time Claude Giroux sent a puck towards JVR at the netmouth and it appeared to deflect off of him, then Lindell and in the back of the net. Just like that the Flyers have a 2-0 lead. This would be JVR’s sixth multi-point game of the season, which, honestly, is a bit of a shock! Great effort by Oskar Lindblom would send the Flyers to the power play shortly thereafter, the first official power play of the game for the orange and black. The power play wouldn’t be able to convert however, with the first unit missing the net on their chances and the second unit getting their shots blocked. Some things just never change. You know what else never changes? Carter Hart being the lovable lone bright spot of this hockey team. Hart came up with his best save of the game to that point when he stoned John Klingberg point blank and allowed no rebound. For as little as Hart was tested early on in this game, the fact he was able to make that kind of save so calmly is absolutely outstanding. Travis Konecny and Claude Giroux would look to make it 3-0 with a 2-on-1 rush but Giroux just missed the net and then JVR would trip a Star, sending Dallas to the power play with just under four minutes remaining in the period. This would be the first test for the penalty kill against the top end firepower for the Stars. The penalty kill would pass their first test and almost score a shorthanded goal to boot as Claude Giroux just missed the net on another 2-on-1. Couturier’s patented ability to use his body to shield off opponents paid off yet again as Taylor Fedun picked up a holding penalty, sending the Flyers right back to the man advantage this time looking to hit the net. They would get a few solid chances on the power play before the period ended, but alas would head into the third with 40 seconds remaining on the power play. The Flyers scored the two goals despite losing the Corsi battle fairly handedly in the period. Dallas had the edge in raw Corsi 13-7, scoring chances 5-2, and high danger chances 4-2. The second line continued to dominate for the Flyers, with Voracek and Lindblom the first two in Corsi with Couturier in sixth. The defense pair of Gostisbehere and Gudas were the Flyers best through 40 minutes. Carter Hart was yet again perfect in saves in the second, tested a bit more than he had been in the first. In the final 40 seconds the Flyers would fail to capitalize on the power play, their second missed opportunity of the game on the man advantage. The opening minutes of the final period would be plagued for the Flyers with some lackadaisical passes that luckily didn’t burn them, but not ideal passes to make leading by two in the final period. It appeared as though they fell into the trap of just getting the puck out of the zone a little bit, which caused some of the errant passes. The Stars were pelting the Flyers net with shots in the opening minutes, but Carter Hart was spectacular yet again making the calm, cool, and collected saves the team needed him to make. They would need him to continue to make saves as Wayne Simmonds tripped up Devin Shore, sending Dallas back to the power play. Giroux and Couturier would get the first chance however on the penalty kill, but Anton Khudobin absolutely robbed Couturier on a one-timer after a great pass from Giroux. Khudobin would yet again rob Couturier as Giroux started another 2-on-1. If not for Dallas’ goaltender, this game would be a cake walk for the Flyers. Dallas would fail to score on the power play as the Flyers dominated them from the jump, another strong showing for the penalty kill. Although the Stars continued to push the Flyers somehow managed to get another odd-man rush, this time a 2-on-0 between JVR and Konecny, and again Anton Khudobin made the save. This became ah, just a little bit frustrating to say the very least. Although Dallas continued to get the majority of the chances, the quality of said chances was exactly the best, until Jamie Benn got the puck in the slot and found a way to get it by Hart to make it 2-1. The Flyers clearly went into a shell towards the end of this game, and that is exactly what happens when teams don’t stay aggressive. Then, when they finally did get aggressive, Voracek would bury a rebound on a shot from Lindblom but ah, he was basically on top of Khudobin in the process, so the goal was called back for goalie interference. 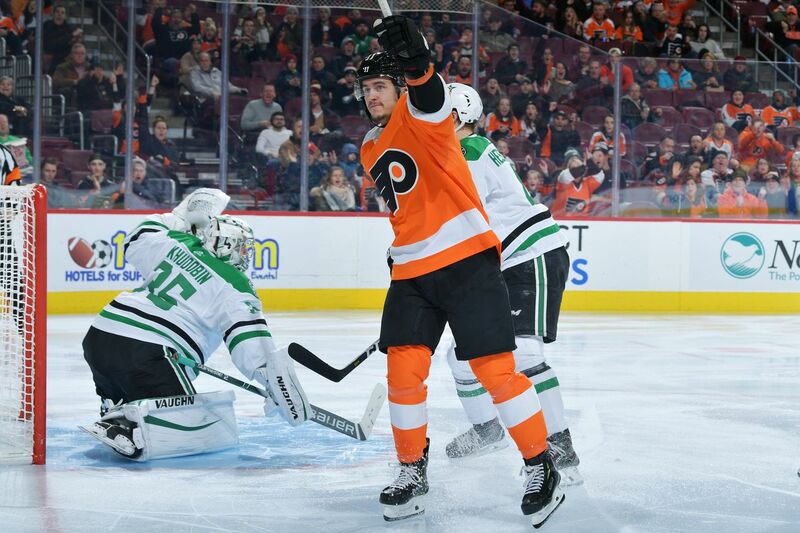 Carter Hart and the Flyers would hang on despite a final flurry over the final minute for the Stars, and finally put an end to the eight game losing streak. They will not lose 10 straight games in back-to-back seasons and the best part was Hart was in net for it. He played outstanding in this one, and deserved the dub.